Manufactured in France from 1955 until 0. 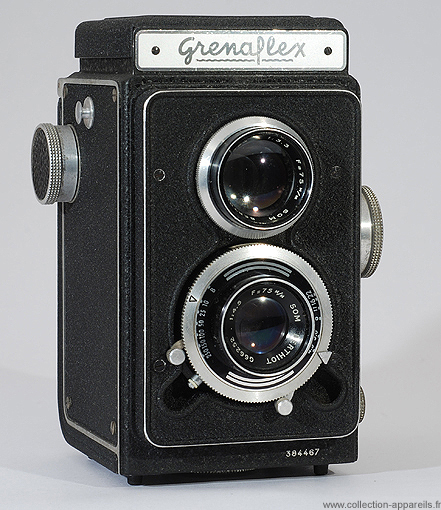 This camera manufactured by Sem but distributed by Grenier-Natkin is even more spartan than theT 950: covering, even false, has disappeared, strap rings are replaced by simple rivets. No depth of field table , no magnifier in the viewfinder hood, viewfinder hood lock disappears (which will be done on all other models ...). This is to show a call price, and do everything to try to sell a more advanced model, which usually occurred. This makes these distributors cameras very hard to find. In October 1957, Grenier decreased the price of its Grenaflex from 14,250 to 10,690 francs, and in October 1958, sales ads announced it at 15,000 instead of 20,000 francs. Viewfinder lens "1:3.3 F = 75 mm Som Berthiot G58454" on shooting side "1:4.5 F = 75 mm Som Berthiot CG66252."